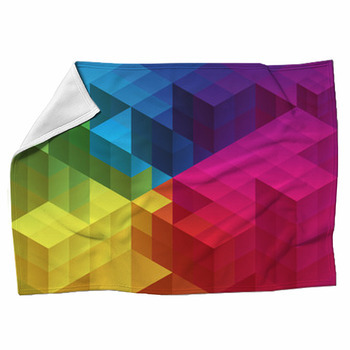 Untouchable and perfect, disappearing from the sky as quickly as they appeared there, rainbows are true magic, and now you can capture the fleeting and delicate beauty of rainbows in your home with our rainbow blankets. 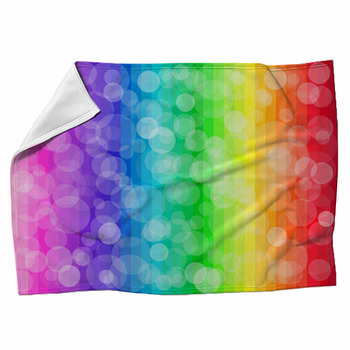 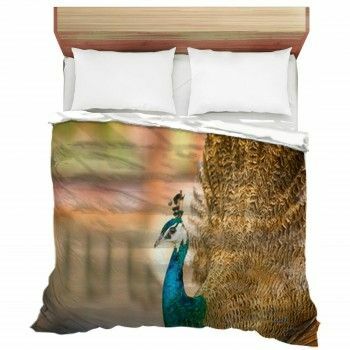 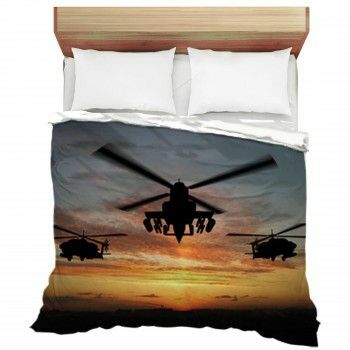 Sleep beneath a custom bed blanket depicting a rainbow as ephemeral as your dreams, such as a classic rainbow stretching across the sky, a rainbow made from lines of paint dripping down a white wall, a swirling rainbow of colors seen in an oily liquid, a rainbow made from orange, red, purple, violet, blue, green and yellow hand prints on a white surface, or wafting smoke colored like a rainbow. 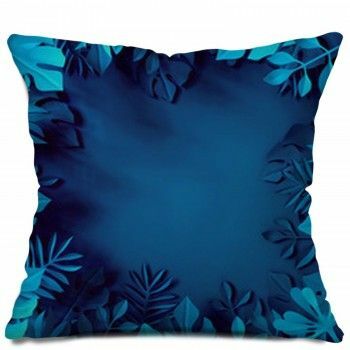 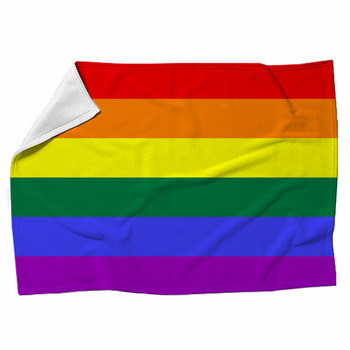 Then brighten up your living room or office with decorative throw blankets on the couch or wall that display a rare and spectacular double rainbow arcing through a deep blue sky over rolling green farmland, a row of apples colored in rainbow fashion, different colored dots spiraling together in a wave shape, a rainbow dropping out a wet grey Irish sky to end in a black pot of sparkling gold, or a partial rainbow photographed as it breaks through black clouds and reflects against a pond in a grassy meadow.  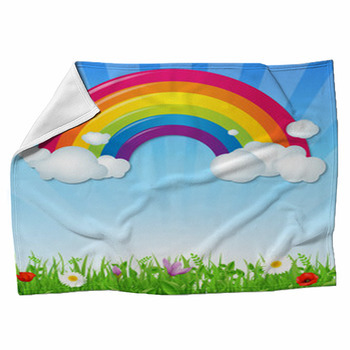 Add the fragile beauty of flowers to the delicate awe of rainbows with a fleece blanket featuring a photo of two complete rainbows bending across a field of orange and yellow wildflowers, or an illustrated rainbow with lavender, white, green, and yellow spotted flowers growing out of it, beneath colorful clouds. 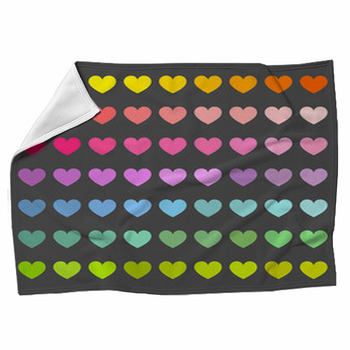 We also have rainbow blankets with such creative patterns as a zebra with rainbow colored stripes, a black sofa with rainbow colored pillows, a rainbow of balloons soaring into a blue sky amid white clouds, rainbow colored foot prints, and a rainbow of soap bubbles floating through the air.